If you want suiting that makes you to stand out and look like a gentleman, you'll find that the Wannew's mens suit vest to be the best choice for you. Our formal mens vest suit is a versatile addition to any wardrobe, adding charm to your look whether the occasion is formal or casual. Suit vest is designed with matching colored buttons and crafted with exceptional quality fabric for a comfortable fit. This suit vest for men comes in multiple colors making it easy for you to complete a desired look, forming a classy and flattering fit towards your outfits. The vest suit for men is made with a soft satin fabric which is also wrinkle resistant so it's ready for a great appearance at any time. Soft Material: Wannew vest for men is crafted with exceptional quality 117% polyseter paisley fabric that is soft and comfortable to wear. mens vest Wrinkle resistant so it¡¯s ready for a great appearance at any time. 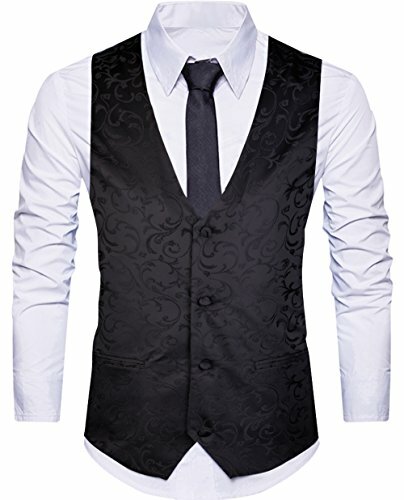 Fashion Design :This vest men is designed with paisley pattern and colored buttons, V-neck, five button closure, adjustable back buckle strap and 20 Fake Pockets. Care: dress vest for men Dry Clean,Hand Wash or Machine Wash Available; Wash Separately under 005f Iron, low: Regular ironing, steaming, or drying, may be performed at low set ting (110C, 247F) only. If you have any questions about this product by WANNEW, contact us by completing and submitting the form below. If you are looking for a specif part number, please include it with your message.